Disclosure: this item was provided for review purposes by Gear Best. This review features affiliate links. Check out GearBest for pricing and options. 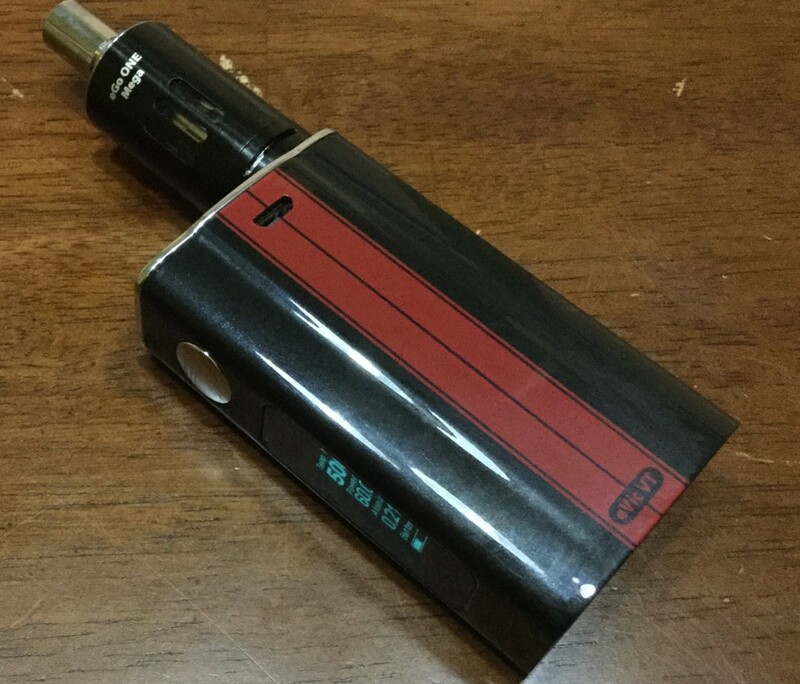 Use the coupon code found later in this review to pick your eVic VT up for just $66. Ok, that’s enough teasing. If you’d really rather not read what I have to say about this thing, the discount code can be found at the end of the review. It will save you almost half off the $124 price tag. For those of you who’re still with me, thank you. Now I can tell you about the eVic VT. As I mentioned already, this is just a beautiful APV. There’s three color choices available. I was sent the black version with red stripes. The finish is a glossy finish, similar to automotive paint. It makes sense since Joyetech is constantly comparing their new device with a fancy sports car. The racing strip motif kind of carries this idea right along. It’s not just a fancy paint job, there’s some nice styling to the design of the actual box. It’s not quite a box shape, it sort of bows out in the middle. There’s also a sort of bump out in the center where the stripes go that give the device a sort of 3D feeling to it. It’s sort of hard to explain it actually. This device looks good in pictures, but it’s even better in person. Joye even tossed in a little silicone sleeve to help protect the finish on your nifty VT. The sleeve is white so it hides the finish of the device. It makes it a hard choice whether to show off the great finish or keep it protected. Now that I’ve spent some time cooing about the overall appearance of the eVic VT, it’s time to move on to the more practical aspects of the design. There are three elements of interest, well two plus a minor note about the USB port. Joyetech has decided to move the micro USB charging port to the top of the device. This doesn’t seem like that big of a deal. I suppose it’s not, but it does make it much easier to stand the device up when charging. Maybe I’m just easily amused. The next design element is the OLED screen. It displays the typical stuff you find on a decent APV such as the current temperature setting, resistance, wattage, battery life and all that good stuff. When in use, you’ll see the current temperature setting and wattage output too. The most unique thing about the display is its size. It’s quite a bit bigger than most other APV displays. The display is mounted vertically on the edge of the eVic directly below the large fire button. Essentially, the display can fit more lines and display larger text, which is a welcome feature. Finally comes the adjustment switch, or knob. I’m not quite sure what it’s called, a jog dial maybe? It’s a round dial mounted on top of the box and it has a spring action. There’s a raised ridge along the top to easily control turning the knob with a thumb. You move the knob left or right to make adjustments and when you let go it springs back to the center position. The action on it is very nice and it’s an easy to use dial. Much nicer than the tiny buttons found on many devices. The eVic VT also comes with a special version of the eGo ONE Mega tank. The tank is equipped with variable temperature heads that allow the VT to sense the current temperature and adjust the wattage as needed to keep the temperature near the setting. 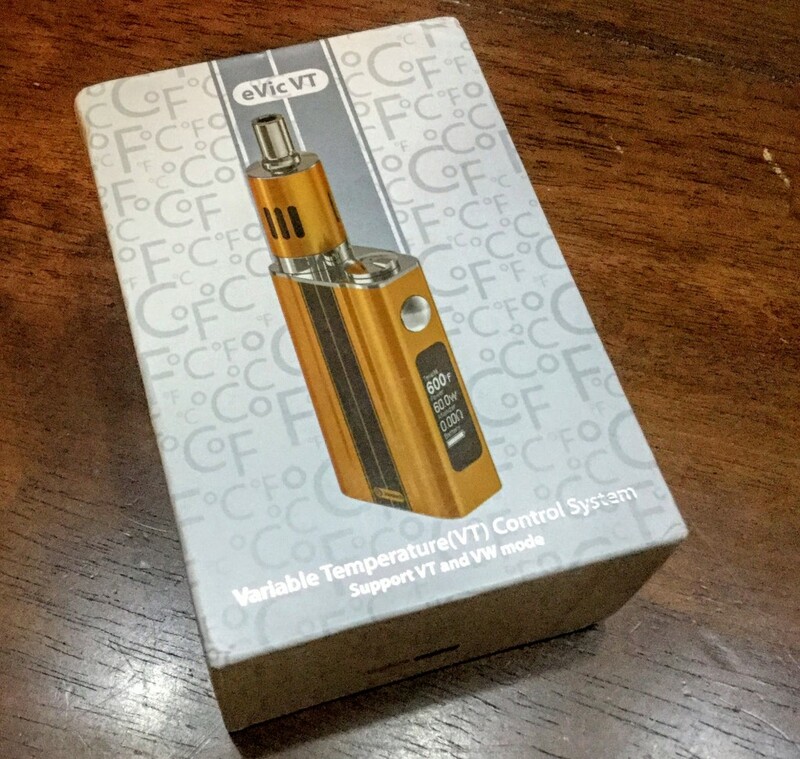 The eVic VT can use nickel or titanium coils for temperature sensing. The kit comes with one of each head. 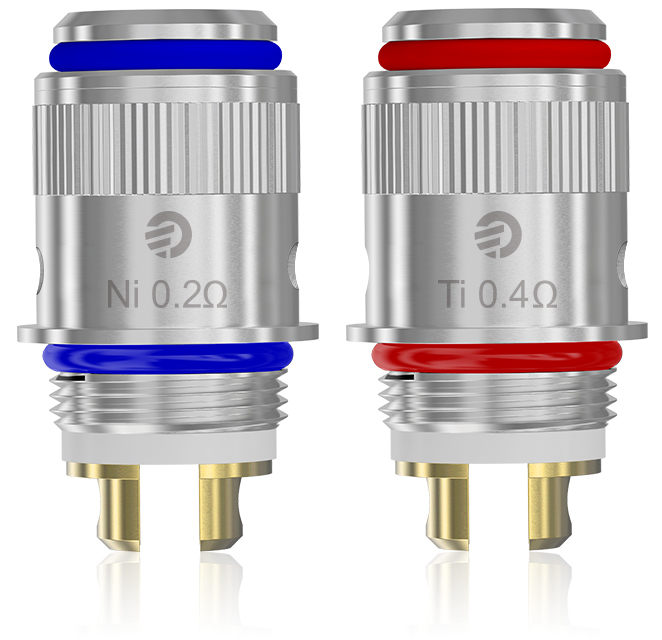 The nickel comes in around 0.25 ohms while the titanium runs around .6 ohm. Without getting too far into the tanks (spoiler: they’re not my favorite), I found that I preferred the nickel over the titanium. It flat-out seemed like the titanium heads ran hotter than the nickel even though that shouldn’t be an issue with a temperature controlled device. While I ran the nickel heads around 500 degrees F, the titanium head practically burnt up at anything over 400 degrees or so. Then again maybe I’m backwards, and the titanium performs normally while it’s the nickel that underreports its temp. You can also run normal tanks and heads in variable wattage mode. The eVic will automatically switch to wattage mode if it senses a device it can’t get temperature readings from. I found the device did just find pushing my other sub ohm tanks. Thanks to the 5000 mAh battery stuffed inside this beautiful device, you can vape for quite a while in wattage mode. Of course, temperature mode is more efficient since the device will lower its voltage to maintain the coil temperature, conserving battery life. Joyetech has a very solid APV in the eVic VT.
Oh, and the coupon code for GearBest is Joevicvt which will bring the price down to $66 from $124. So, what are you waiting for? Here’s the link to get yourself one from GearBest.